Good morning! Happy Monday! And a glorious week it already is. I've finally got a small reprieve from my work, and I'm glad to have just a bit of time to enjoy, wind down, and prepare for what's to come. I've also got AMAZING things coming my--and by association, your--way, involving #ReebokNYC, #CrossFit, and #HLS12! Couldn't be more excited. But for now, I'm still smiling about yesterday's run. 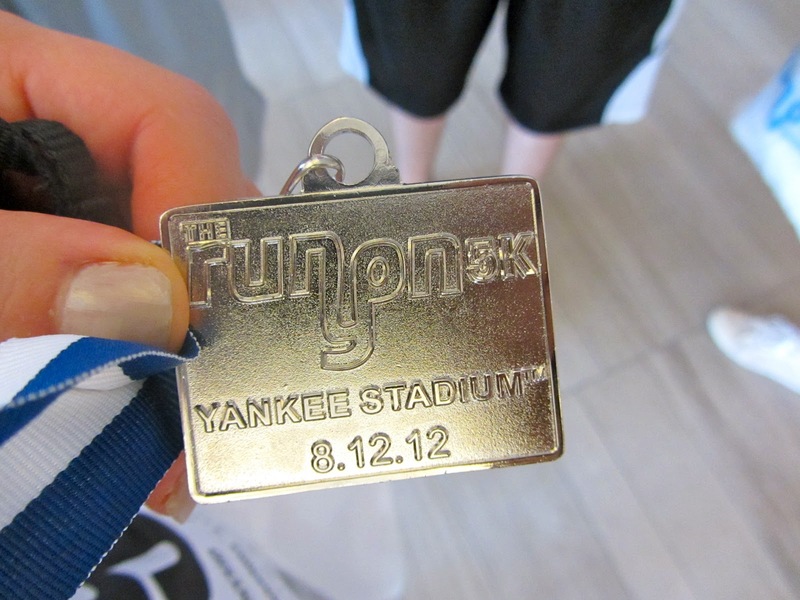 Started off my week with a bang, participating in the fourth annual Damon Runyon 5k Run/Walk for Cancer Research, a 3.1-mile race that circles in and out through the greatest place on Earth: Yankee Stadium. Eric's father and brother have run the last three years, last year Eric joined them while his mother and I cheered on, and this year I joined their ranks and signed up. It was nice motivation to keep running through this summer, even though I did not always enjoy running in the heat and often opted for the treadmill, instead. Oh well! We had wonderful weather; it was a beautiful Sunday morning in the Bronx! We parted with our family supporters (and my camera, so all photos are from their view until the end) and joined the runners inside the gate for opening remarks by NBC anchor Michael Gargiulo, President & CEO of the Damon Runyon Foundation Loraine Egan, and two former Yankees: Ron Bloomberg and Mickey Rivers! ... and then we were off! The course took us twice around the entry level concourse, which was a shorter run than I thought it'd be. Music, views of the field, cheering volunteers -- all good fun! Then we took it down via ramps into the innards of the stadium, down where regular fans don't get to venture on their own. There, it was eerily quiet, the music no longer audible. Running at a comfortable pace, we passed the locker rooms, the team bus doorways, and eventually curved to see light ahead, greeting us as we made our way onto the field, the same way players do. Bright sunlight and green grass greeted us. The warning track dirt very nice to run on. Spotted our family members waving to us, and waved back. See our faces on the big screen was definitely a moment to remember. The boys jumped up to touch the foul pole each time we passed, but I failed. Too short. The course required two laps around, so we circled around over and over... and over, savoring our time out on the field in Yankee Stadium. At last, the fun had to end and we made our way back inside for the remainder of the 5k route. This part was far less enjoyable, especially coming back in from outdoors. We went around the concourse, then up STAIRS to the higher level, circling around, and back down ramps to the lower levels. Another lap, and back up the stairs. The stairs took it all out of me. The run itself, I was happy with, but every time we finished a multiple-flight stair climb, I required a moment of recovery. At one point I accepted a small cup of water hoping it would help, but I am incapable of drinking on the run and instead spilled it on my face. Felt good! Hah, but seriously, note to self: I need to work on my STAIR endurance! After each set of stairs, Eric would slow down with me while I recovered until I could fully jog again to catch up with Scott and Steven. He reminded me I didn't have to run, I could jog slowly. I responded that I'm not used to that, but I had to take it slow, overcome the "run or walk" attitude. We ran the final laps before coming to the "down" ramps one last time. Eric's father and brother ran full speed ahead, racing to the finish, but I kept pace, enjoying myself again now that the stairs were behind me. And then... FINISH LINE! I cannot report a final time; I chose to not wear my Garmin so did not track my pace or true distance run. This run was for FUN. So the finish line came and went; we ran through, passing bananas, chips, water, bagels, etc., and reunited with Scott and Steven. After it was over, I was a little bit sad and would've loved to hit the field again. The weather was so nice, I could've stayed out there all day long! (Just keep those stairs away from me.) So I refueled with a banana and water, while Scott did fifty pushups to earn a signed Mickey Rivers baseball, which he presented to my dad. We rejoined our spectating families, who were cheering us on the whole time, and equally persevered through the heat and strong sun in the stands. Another 5k, on the books! Thank you to my grandparents and parents for sponsoring my participation in this race, and to Jessica and Barbara for coming out early on a Sunday to show support. Thanks also to Scott, Steven, and Eric for inspiring me to go further! This run was a blast, and I look forward to a repeat improved performance next year.